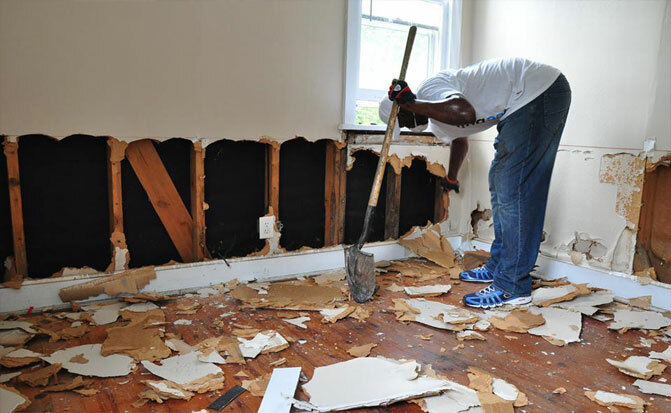 You can rely on our experienced and highly trained water damage restoration team, to restore your home after water damage. We’ll help you get your home life back to normal as soon as possible. We know how important it is to fix water damage as quickly as possible to prevent longer-term damage to your home. That’s why you can call us 24/7 in a flood emergency at our Northern Beaches office. We’ll talk to you about the flood situation to advise you on the best immediate course of action. We’ll tell you if it’s safe to leave or if we need to come out immediately. We’ll then come out to assess the damage and fix the problem with as little impact as possible to you and your family. If you own or manage a business, warehouse or strata property that is flooded, we will get you back in business as quickly as possible. Our water damage specialist will carry out our flood restoration process, comprising services that will prevent long term damage to your property, minimise inconvenience and most importantly get your business up and running again. We’ll drain the water, install drying equipment, monitor the drying process (including slabs & walls), apply anti-microbial & anti-browning treatments then sanitise and deodorise the carpets. We’ll bring the right amount of equipment to get the job done in the right amount of time. We can supply you with a costing schedule outlining the cost of electricity for equipment so you can claim this back from your insurance company or landlord. The most an air dryer will cost is $4 a day for electricity. Call us at our Northern Beaches office anytime 24/7 for flood emergencies on (02) 8007 7205. Our water damage specialists will offer immediate advice over the phone and arrange a time come to your home or office to assess the work required and to run through our water damage repair process. We’re reliable and we’ll stay in touch on the day so you’ll know exactly when we’re coming. We don’t leave our clients waiting around. Our team is certified in rectifying water damage in homes and commercial properties. The head technician working on each water damage and restoration job has completed vocational training in water damage at ITI. For a fast response to water damage issues by an experienced specialist to any type of property in the Northern Beaches, Upper and Lower North Shore, Eastern suburbs and the Inner West, contact Pressure and Steam’s Northern Beaches office on our 24/7 emergency phone number (02) 8007 7205. Our commercial water damage services are available throughout all of NSW.